Update: Looks like many states are now moving forward with out-of-state sales tax. My guess is that many states are going to set minimum revenue amounts so the small entrepreneurs and small EBay sellers won’t be impacted. Let’s hope. ” INDIANAPOLIS— The Indiana Department of Revenue (DOR) is announcing next steps after the U.S. Supreme Court issued its landmark decision in South Dakota v. Wayfair, Inc on June 21, 2018. Out-of-state retail merchants with annual gross revenues from Indiana sales exceeding $100,000, or 200 or more separate Indiana transactions will need to register and remit Indiana sales tax. Pending resolution of a declaratory judgment action filed in 2017, DOR will begin enforcing Indiana’s economic nexus law on October 1, 2018, on a perspective basis. The Wayfair decision overturned the Court’s 1992 ruling in Quill Corp. v. North Dakota, which required a retail merchant to have a physical presence in a state to be subject to state sales tax registration and collection requirements.Indiana’s existing “economic nexus” law, effective July 1, 2017, is found at IC 6-2.5-2-1(c), and provides that a retail merchant that does not have a physical presence in Indiana shall collect the gross retail tax on a retail transaction made in Indiana if certain threshold requirements are met. In 2016, the state of South Dakota established an economic nexus standard for sales tax. This standard requires sellers who meet certain revenue or transaction thresholds to collect and remit sales tax to the state even if they have no physical presence in South Dakota. In September of 2017, the South Dakota Supreme Court held the state’s law to be unconstitutional. However, in January of 2018, the U.S. Supreme Court agreed to hear the case with a ruling expected in the summer of 2018. The case title is South Dakota v. Wayfair, Inc. Since the 1992 U.S. Supreme Court case, Quill v. North Dakota, the standard for collecting and remitting sales tax to a state has been a physical presence in the state. This physical presence, or nexus, is created by having facilities in the state, employees in the state or even sales personnel travelling to the state. On-line sellers have benefitted from the physical presence requirement. 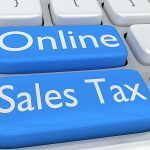 By being able to sell goods in states where they have no physical presence, on-line retailers have escaped the need to collect and remit sales tax in those states. If South Dakota prevails in the case, the physical presence requirement could be replaced with economic nexus which is measured by a retailer’s revenue or number of transactions in a state. This would require on-line retailers who were not previously required to collect and remit sales tax to do so. The legal issue with the Quill case was the regulation of interstate commerce. The ruling was that only Congress has the power to regulate interstate commerce and state action cannot restrict interstate commerce. If the U.S. Supreme Court relies on legal precedent, it may keep the physical presence standard. It may also recognize the realities of an internet economy where the physical presence standards could be construed as outdated. Another option is to say that only Congress can decide the issue. The stakes are high for both states and retailers. Alabama and Washington are other states with an economic nexus standard. Colorado has been trying to pass economic nexus and finally settled on requiring all Ecommerce companies with Colorado sales to submit a list of those sales to Colorado and to notify purchasers that they must pay Colorado use tax. Idaho, Illinois, Louisiana, Mississippi, Nebraska, Oklahoma, Utah, Rhode Island and Vermont have also introduced legislation to create economic nexus. If the court rules in favor of South Dakota, expect many more states to enact economic nexus standards.